Defining and exploiting value proposition is an essential part of wearable technology's journey from early adopters into mass markets. Sensor platforms enable the key value proposition in most wearable devices today. 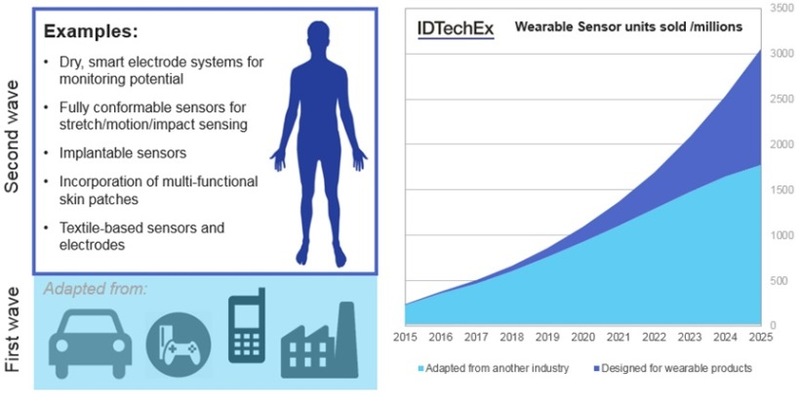 This is why made-for-wearable sensors are being developed around the world and why IDTechEx Research finds that made-for-wearable sensors will represent 42% of all sensors in wearable devices in 2026, up from a measly 7% in 2015. There will be a $5.5bn market for sensors used in wearable technology applications by 2025, according to IDTechEx’s best-selling research report on the topic. With detailed coverage of the 15 most prominent sensor types in wearables today, this report gives a thorough overview of the technology, challenges and opportunities behind one of the key components behind the success of wearable technology. key vertical markets. Healthcare is perhaps the best example, where regulatory processes and liability issues remain extremely prominent. Leading doctors admit that those who fail to adopt of technology in the form of digital health or otherwise will 'fall by the way side' as advances occur. However, until all of the parties (device manufacturers, physicians, insurance companies, patients and the lawyers of all the above) understand a clear system of liability, this remains a significant barrier to adoption. Wearable sensor systems have already begun to unlock new markets. The textile and electronics industry has started to merge together around e-textiles. In the earliest products reaching the market, advances in low-energy communication can be paired with new made-for-wearable sensor types based on textiles and inks that are increasingly washable, comfortable and reliable. The current commercial focus here is on high value sport and fitness applications in the short term, but this will spread to wider industries including healthcare, home textiles and industrial spaces in the next 2-5 years. 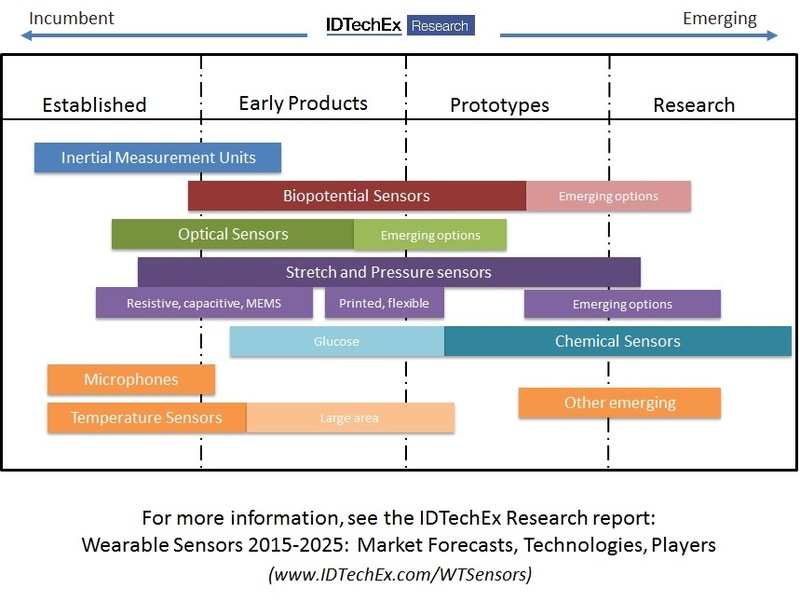 The IDTechEx report concludes that these sensor types will climb to huge volumes in the coming decade. As the number of wearable devices and the number of sensors per device both increase rapidly, sensors used to detect motion (stretching, deformation, etc. ), force and pressure will be one of the largest winners, growing at 40% CAGR. The technology landscape here is in a period of divergence. Introduction of stretchable and washable inks, electroactive polymers, textile electrodes and printed piezoelectric sensors add to traditional techniques like inductive sensors using conductive elastomers or otherwise. This broad technology landscape is a challenge for product designers. With many different materials come different requirements for connector types, electrical specifications, data algorithms and more. It will take some time for clear winners to emerge, and many large companies are still hedging their bets. In 2015, half of all wearable sensors are based on MEMS technologies. Inertial Measurement Units (IMUs) are found in every smartwatch and fitness tracker, making the most of mature MEMS components that are reliable, familiar and cheap. However, the challenge here is in turning raw data into useful, or ‘actionable’ data. Sensor fusion is the process of combining sensor outputs from multiple sensors to gain greater total insight. The most common example is using individual xyz acceleration and rotation data (e.g. from a 6-axis IMU) into motion data. This in turn can be used to count steps, differentiate between activity types and so on. It is here that MEMS IMUs see more use cases. For example, they are used alongside optical sensors to manage motion artifacts experienced in optical heart rate monitoring. This was a far more traditional use of such components in physiological analytics and now the wearable technology industry is beginning to come full circle.